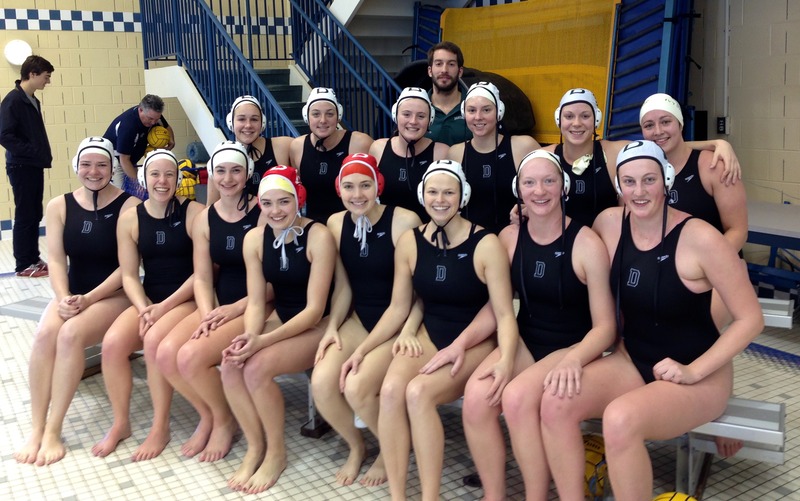 Dartmouth Women’s Water Polo traveled to Middlebury College this past weekend for our first tournament of the season. After an entire term of hard swim sets and scrimmaging against each other, we were excited to face some new competition and some old rivals. All of the hard work definitely payed off, as the team came home with a perfect 4-0 record. 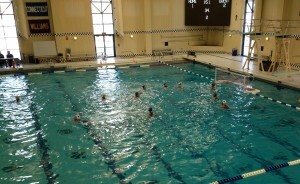 DWWP taking on the Middlebury Panthers in our first game of the season. After some wonderful snacks (thank you, Mr. and Mrs. McDevitt! 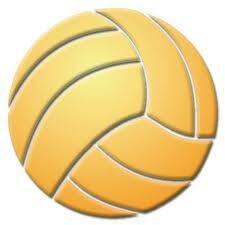 ), the team took on Coastguard, winning 12-2. The 12 points were spread among many of Dartmouth’s players: Kellie MacPhee (’14, #5) scored 3; Grace McDevitt (’14, #4), Amelia Noble (DMS, #10), PJ Bigley (’17, #15) scored 2 each; Katie Lachance (’15, #3), Kristen Flint (’14, #1), Meredith Sweeney (’14, #17) scored 1 each. 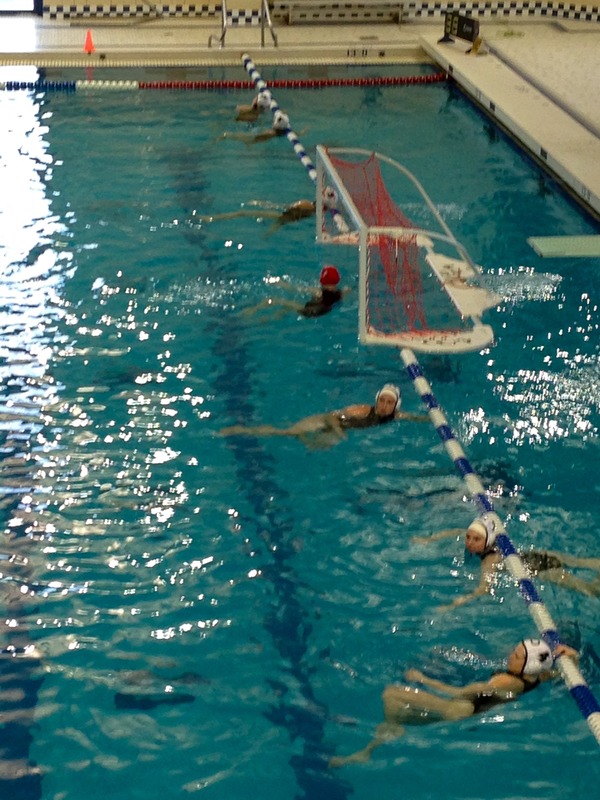 The team lining up before their game against Coastguard. After a nice dinner with some of our biggest fans (thank you McDevitts, Meyers, and Mr. Flint!) and a restful night at the Middlebury Inn, we headed back to the pool for some more water polo. In the morning, the team took on Williams College, winning 14-2. Our goalies – Shelley Wenzel (’14, #1), Grace Russo (’14, #1A) – were in particularly fine form in this game, as Shelley had a 100% save-rate and Grace made some amazing saves in her debut tournament in the cage. After a much-anticipated and delicious lunch at Noonie’s Deli, Dartmouth played our last game of the tournament against University of Massachusetts at Amherst, winning 16-5. Over the course of the weekend, every single field player had at least 1 steal and at least 1 assist! Don’t forget, for a live play-by-play of the games, don’t forget to follow @DartmouthWaterPolo on Twitter! All in all, the team had a fantastic weekend and an exciting start to the season – everyone is excited to head back to Middlebury for our next tournament (March 15-16)! Everyone had a fantastic time at the tournament this weekend!